sleep now in this mild September light. linger at the edge of sight. 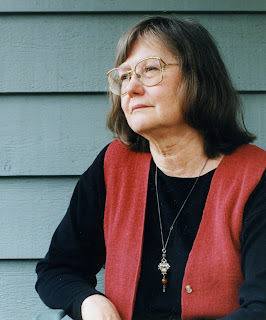 Author of eight books of fiction, two-time winner of the Canadian SF Aurora Award for her novels Songs from the Drowned Lands(1983) and The Snow Queen (2000), Eileen has been quietly publishing startling gems of poetry in magazines and anthologies throughout the years. A selection of these was collected in the eighteen page chapbook The Dark Gardens of the Zodiac by Neville Books in 1999. This limited edition chapbook constitutes one section of the upcoming collection. Kernaghan practises her craft with a skill and sensitivity that does credit to the genre. Her unmistakable voice provides a subtle, unifying under-note that runs throughout this diverse collection. With this collection, Kernaghan inhabits that strange netherworld, astraddle both yin and yang, one foot in the fierce daylight of knowledge and reason, the other in the dark mysteries of myth-ologies, the absyssal wood—whose “shadow is always there/dark subtext, dissonance…” Her sly words, fevered dream visions and lurking rhythms dance the reader a merry chase down peculiar paths, where there is sometimes only a “thin light/shining a long way off/like a summons.” Poetry should always, to some degree, be about the uses (and misuses) of enchantment, and Kernaghan has touched something deep and visceral with these verses. You will read them once, then, in the middle of the night, wake suddenly, shivering, and need to read them again. Eileen Kernaghan neither lights a single candle nor curses the darkness—she swallows it whole and then sets it on fire. …creates worlds where magic and myth sing together in dreamlike harmony. There is madness here, mixed with insight, leaving the reader bewitched and transformed, looking both outwards and inwards with strangely enhanced clarity. I first encountered Kernaghan's work when she submitted a beautiful story called "Dragon-rain" to an anthology (Magic) that my daughter Morgan and I published in 1995. The story is the last one in the book and, if I remember correctly, it received an honorable mention in the Year's best fantasy and horror. I wonder if she sent me this book to review on the strength of that prior connection. Be that as it may, I was delighted to receive it. 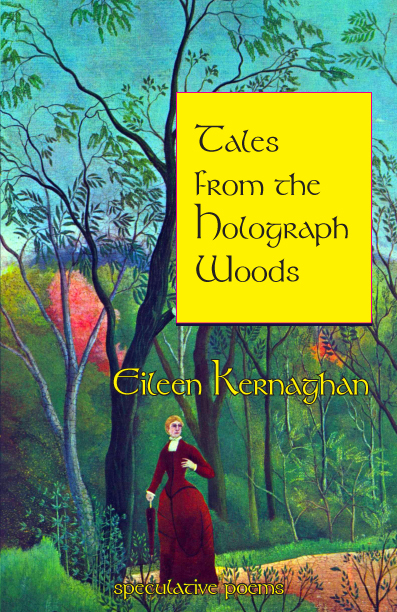 Tales from the holograph woods is a slim volume containing 42 poems in four groups: "The dark gardens of the zodiac," "A dance in four dimensions," "Spells and ancient gramaries," and "Out of the midnight forest." There are also two framing poems that are not included in any of the four groups. The acknowledgments page is ambiguous, but appears to imply that all of these poems have been previously published elsewhere, including one in Dreams and Nightmares, long ago. The first poem, "The dream," sets a tone of reverence, carries a weight of myth, and is meant to be read slowly, or so it strikes me. It's an appropriate beginning for a book full of such poems. The next poem, "Re-Incarnate," includes the phrase "the dark garden of the zodiac," from which the first section of the book takes its title. It's funny, but the last four lines of this poem appeared overleaf from the main part. And I kind of think the poem is stronger if you stop at the bottom of the page. I really like this part of the next poem, "In Turing's garden." And isn't that exactly the kind of thing we will face when we apply the Turing Test to things we encounter off world or in the lab? I'm really not sure what dark gardens of the zodiac are, because several of the poems in this section are unequivocally science-fiction poems. Then again, they do have a mythic feel. Science, myth, and magic are commingled by Kernaghan in many of these poems. Another example, from "Deus ex machina"
Here, she uses a literary term to link the writing process to the cosmos in terms both mathematical (elsewhere in the poem) and mystical, leaving us to wonder whether she is really writing about gardens out in the universe or gardens inside our heads. Or possibly descibing a relationship between mental and physical worlds. In the next section of the book, "A dance in four dimensions," most of the poems have some explicit reference to dance, although the references are used differently. Dimensions more than four could express the different aspects of dance presented within this suite of poems. Some of the poems also refer fairly explicitly to dimensionality. From "The idea of order in a Chinese landscape"
My favorite in this section is "Broken syllables," in which translations of remnants of ancient Sumerian poems are used to express the inexorable effect of time on human endeavor. Yet the fragments retain their own beauty and power; illustrating another aspect of dimensionality. Part three of the book isn't really about spells, or at least it is not mostly about spells. It could just as well be said to be about dream, because almost every poem in this section refers to dream or is about a dream. A few of them mention spells or actually are about spells, but to my mind the title of the section is the most opaque of the four. would seem a reference to a dream even if the poem didn't say so two lines later. (The Poet-Chansonnier's song from Wild Talent). By contrast, in "Out of the midnight forest," if the poems don't all refer to midnight, or forests, or both, they all have a darkness about them that is reminiscent of midnight and midnight doings. Anyway, the names of the four sections of this book are taken from lines in the contained poems. By now it's clear they don't necessarily encapsulate the meaning of all poems found therein. Please don't mistake all my wondering about why this was titled as it was and why that was not titled in a different way as intended criticism. This is a wonderful book and I think you need to read it. After you do, it will probably stick with you. From "Wild things"
but will not name them. …the poetry of Eileen Kernaghan (shows both) poetic capability and ease. She projects a living imaginative world, and she can declare her derivations and show them to be absorbed. Eileen Kernaghan is perhaps the most consciously intertextual of the poets in Light Like a Summons.The voices of many writers – Blake, Yeats, Thomas, Stevens and Plath – are echoed in her poems, as are the mythologies and philosophies to which she turns in her search for meaning not confined to the corners of present time and space. Echoing through many of (Kernaghan’s) poems is a conception of nature transformed, being viewed through new windows or new eyeglasses…. Kernaghan is an author to watch. The work of Eileen Kernaghan effectively brings together the individual strengths of the other four writers (in Light Like a Summons) with its sensitivity, wit, large vision, and command of verse technique. EILEEN’S LATEST BOOK, WILD TALENT: A NOVEL OF THE SUPERNATURAL, is available through Thistledown Press. The year is 1888. Sixteen year old Scottish farmworker Jeannie Guthrie fears she has accidentally killed her ne’er-do-well cousin George, and flees in panic to London. Drawn reluctantly into the world of the occult, and seemingly haunted by her cousin’s vengeful ghost, Jeannie must learn to control her mysterious power to in order to survive. “Acclaimed Canadian author Eileen Kernaghan … is known both for her painstaking historical research and her interest in diverse cultural and historical manifestations of spirituality. Wild Talent is no exception. “Wild Talent describes the setting and feeling of this time period very well. The background information …is not obviously superimposed on the plot, and the character development is excellent. The reader can see Jeannie’s growth from a scared farm worker to a knowing, mature woman.” Recommended. Canada 124 Medal for community arts activism, 1992. Shortlisted for the Sheila Egoff Prize in Children’s Literature, 2005, for The Alchemist’s Daughter. Wild Talent: A Novel of the Supernatural, shortlisted for 2009 Sunburst Award.